When thinking of uninterrupted power supply, the first word that comes to mind is utility. What modern-day UPS systems are expected to provide is utility. Be it in back-up, in portability, in size or even in looks, they are envisioned to add value to customer requirements and perform beyond their expectations. If you too are on the search for a high-utility device, let your hunt stop right here. You have just found the versatile SESTO 1000 from the house of V-Guard. 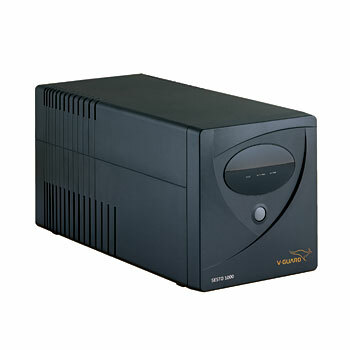 SESTO 1000, apart from being much more than a normal UPS System, is an amazing performer when it comes to the original task expected out of it. It features a special technology that helps to defend connected components and data from the noxious effects caused by power variations. The backup is amazing and it also protects your individual work areas, home networking hardware and devices and entertainment electronics with maximum efficacy. Apart from these, it is built with a capacity to automatically regulate voltage fluctuations with precision. Appealing design, affordable pricing and amazing utility – these qualities summarize the wonder that the SESTO 1000 is.